Ferol Helois Coats, 90, of Carlisle, died July 26, 2016 at Chambers Nursing Home in Carlisle. Ferol was preceded in death by her husband, T.B. Coats. 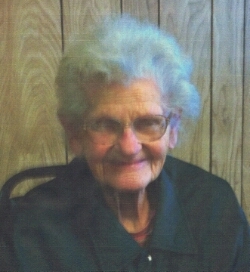 She was a member of the First Baptist Church of Carlisle and taught Sunday School for about 50 years. She was last employed in quality control at Remington Arms. Ferol is survived by one son, Donald Coats and wife, Judith of Cabot; daughter, Tommie Lois Harper of Carlisle; brother, Sam King of Memphis; sister, Patsy Kittler of De Valls Bluff; four grandchildren, Sarah Catherine Gray, Tim Harper, Adam Coats, and Monica Griffin and ten great-grandchildren. Funeral services will be Friday, July 29, 2016 at 2:00 P.M. at the First Baptist Church in Carlisle. Visitation will be from 6:00 to 8:00 Thursday at Westbrook Funeral Home. Interment will be in the Carlisle Cemetery. As an extraordinary lady, Mrs. Coats will be dearly missed by all those who knew her. As the loving matriarch of her family, she remained actively involved in the lives of her children, grandchildren, and great-grandchildren. When I think of Mrs. Coats, I am reminded of one of the “core values” of the U.S. Air Force: “Service before self.” Mrs. Coats loved her family and friends dearly and she often sacrificed for their benefit, lovingly serving others before herself. Her example serves an uplifting inspiration to others. We offer our deepest sympathy to her family and many friends. May God’s Word and His Holy Spirit (the Comforter) provide strength, comfort, and assurance in this time of sorrow. As fellow believers, we know that we shall see Mrs. Coats again, thanks to the assuring promise of eternal life that we have in God’s Son Who is our Savior Jesus Christ. Don, we were sorrow to learn of your mothers passing and just want you to know that you are in our thoughts and prayers. J. D. and Fern Todd at Greers Ferry.